(Nanowerk News) This part of the constellation of Sagittarius (The Archer) is one of the richest star fields in the whole sky -- the Large Sagittarius Star Cloud. 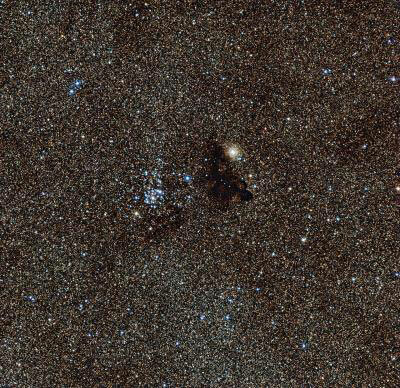 The huge number of stars that light up this region dramatically emphasise the blackness of dark clouds like Barnard 86, which appears at the centre of this new picture from the Wide Field Imager, an instrument mounted on the MPG/ESO 2.2-metre telescope at ESO's La Silla Observatory in Chile. This object, a small, isolated dark nebula known as a Bok globule , was described as "a drop of ink on the luminous sky" by its discoverer Edward Emerson Barnard , an American astronomer who discovered and photographed numerous comets, dark nebulae, one of Jupiter's moons, and made many other contributions. An exceptional visual observer and keen astrophotographer, Barnard was the first to use long-exposure photography to explore dark nebulae. Through a small telescope Barnard 86 looks like a dearth of stars, or a window onto a patch of distant, clearer sky. However, this object is actually in the foreground of the star field -- a cold, dark, dense cloud made up of small dust grains that block starlight and make the region appear opaque. It is thought to have formed from the remnants of a molecular cloud that collapsed to form the nearby star cluster NGC 6520, seen just to the left of Barnard 86 in this image. NGC 6520 is an open star cluster that contains many hot stars that glow bright blue-white, a telltale sign of their youth. Open clusters usually contain a few thousand stars that all formed at the same time, giving them all the same age. Such clusters usually only live comparatively short lives, on the order of several hundred million years, before drifting apart. The incredible number of stars in this area of the sky muddles observations of this cluster, making it difficult to learn much about it. NGC 6520's age is thought to be around 150 million years, and both this star cluster and its dusty neighbour are thought to lie at a distance of around 6000 light-years from our Sun. The stars that appear to be within Barnard 86 in the image above are in fact in front of it, lying between us and the dark cloud. Although it is not certain whether this is still happening within Barnard 86, many dark nebulae are known to have new stars forming in their centres -- as seen in the famous Horsehead Nebula (eso0202 - http://www.eso.org/public/news/eso0202/), the striking object Lupus 3 (eso1303) and to a lesser extent in another of Barnard's discoveries, the Pipe Nebula (eso1233 - http://www.eso.org/public/news/eso1233/). However, the light from the youngest stars is blocked by the surrounding dusty regions, and they can only be seen in infrared or longer-wavelength light. Bok globules were first observed in the 1940s by astronomer Bart Bok. They are very cold, dark clouds of gas and dust that often have new stars forming at their centres. These globules are rich in dust that scatters and absorbs background light, so they are almost opaque to visible light. This quotation comes from E. E. Barnard, Dark Regions in the Sky Suggesting an Obscuration of Light, Yerkes Observatory, Nov 15 1913 (available online here: http://adsabs.harvard.edu/full/1913ApJ....38..496B).